Knoxville’s International Biscuit Festival is upon us once again. This year it takes place on May 16th-18th in Market Square. For three days, downtown Knoxville celebrates all things biscuit. Whether you’ve gone every year or this will be your first year, this is an event that you will not want to miss. 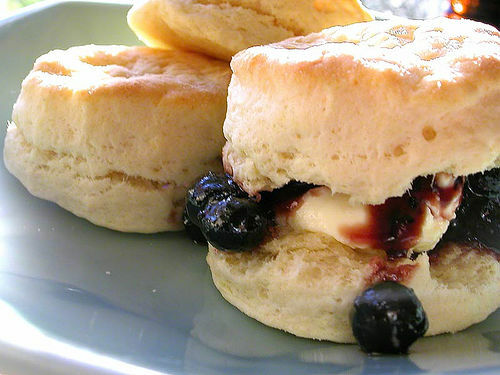 The Knoxville Biscuit festival been ranked as one of the Top 10 Food Festivals by Livability.com. For the first time, Southern Living will be a partner in this year’s festival. Southern Living staff will be doing demonstrations throughout the festival and attendees will be able to taste recipes straight from the Southern Living Test Kitchen. In addition, the festival will be also be kicked off by a two day Southern Food Writing Conference. The writer’s conference is open to any food blogger, writer, or food enthusiast. One of the most popular events is Biscuit Boulevard. It allows those that attend the event to sample five different biscuit creations. Tickets can be purchased for $10. Biscuit Boulevard is open on May 18th from 8:30 a.m. to 3 p.m. Biscuit Boulevard offers a great opportunity to taste delicious samples from the festival’s many vendors. Another very popular even is the Biscuit Bake Off, which will be held on May 18th. The Bake Off has four categories of competition: traditional biscuits, dessert biscuits, most creative biscuits, and student biscuits (participants must be under 18 years-old). Anyone who is a resident of the U.S. is able to compete and is able to submit multiple recipes. The competition is judged based on the deliciousness and presentation of each submission. In addition, there are a wide array of other events included in this years International Biscuit Festival. There is a Biscuit Bazaar, a brunch sponsored by Blackberry Farm, live entertainment, a songwriting contest, and a Mr. and Miss Biscuit Pageant. Have you been to the Biscuit Festival before? Are you looking forward to going this year?